Beautiful brides and hands-on grooms in search of inspiration for your big day: look no further. Some brides love to have a little fun with their wedding day- and why not? 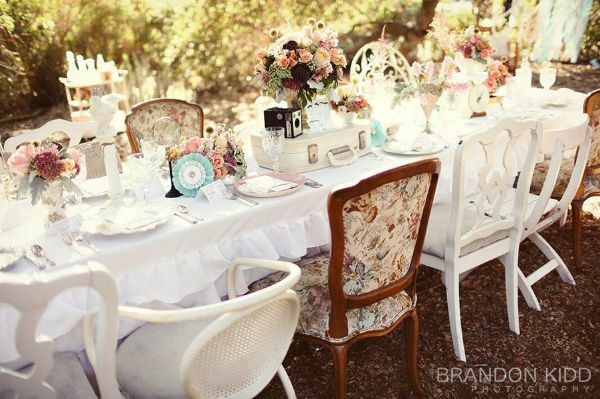 Shabby-chic is all about minimalism and freshness: a great idea for those of you who’re working to a budget. 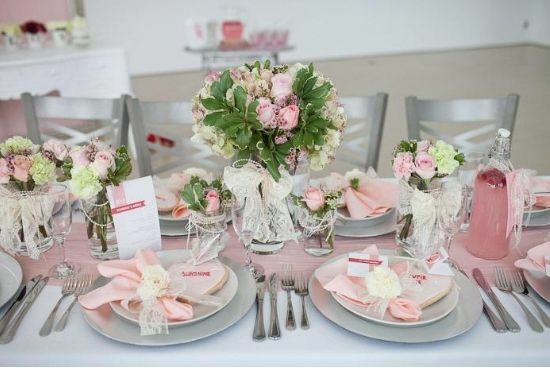 To achieve a pretty chic wedding, look for softer tones and avoid colours which can be loud and brash. We love the subtle colour scheme this couple have gone for; it’s elegant, it’s bold and with a bit of shopping around it won’t break the bank. The modern day vintage style is just gorgeous and can be achieved for next to nothing. The great thing about vintage styles is that virtually everything is mismatched and still looks fab. The finer detail here is what makes this deco idea so special. A fusion of clean, funky and fresh; perfect for our all of our vintage lovers in search of a bargain. Charity shops are crowded with vintage style and genuine vintage cast offs- some in need of a polish, some perfect and ready to go. Get your creative cap on and scour your local charity shops now: there’s always bargains to be had. 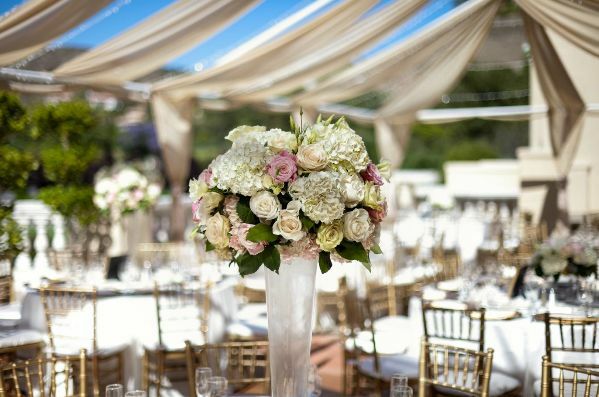 One of the most popular venue styles is a décor which boasts warmth and elegance. 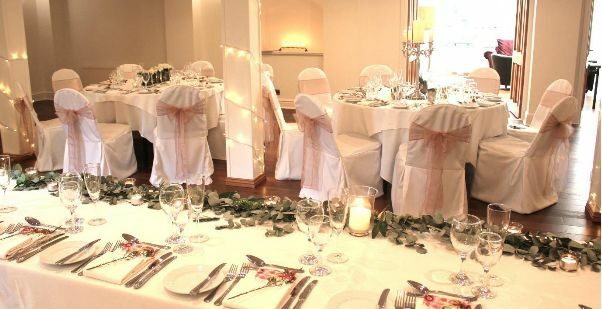 Delicate fairy lights, candle lights and floral features add a lovely touch and make virtually any venue sparkle. These simple features can be bought for next to nothing; virtually anywhere! Outdoor weddings are a difficult thing to achieve if you live in the UK and often come in at a hefty price too. With the weather being unable to predict here in the UK, an outdoor wedding can be a risky one but, if you’ve opted for a garden reception, achieving class and elegance at a low price isn’t too difficult. The decoration for outdoor events is usually in your surroundings so over the top table design is just unnecessary. British weddings traditionally occur in picturesque wedding venues along the countryside. 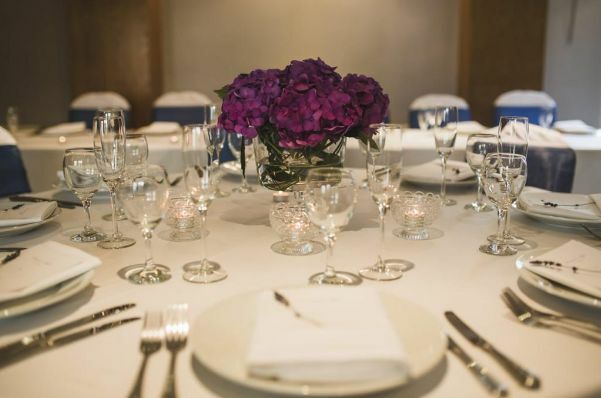 Guests are dined with shiny silver cutlery and minimalistic, grandeur. This formal, traditional table setting is typical of most hotel wedding packages which saves you the time and effort in planning the finer wedding details. We all know, a traditional wedding can cost tens-of-thousands of pounds: something many of us simply can’t afford. Our advice when planning your wedding reception is to shop around and relax. After all, your wedding is yours and nobody else’s, as long as you’re happy, your guests will be happy and you’ve achieved a day to remember.